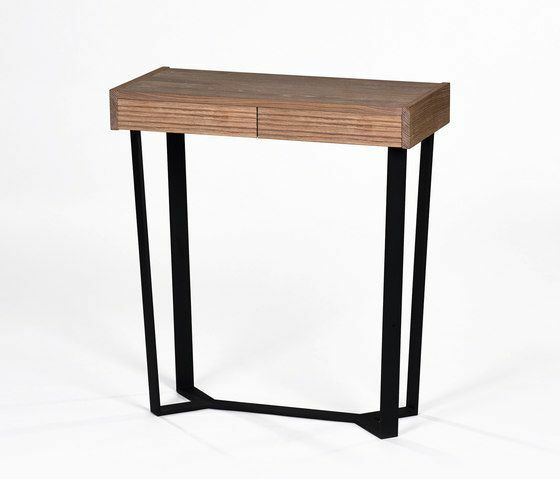 A console table offers a practical spot for keeping sunglasses or car keys and when skilfully positioned, this piece of furniture will find its niche anywhere. Due to its unusual mix of materials, Dexter is a captivating piece of furniture. European oak and solid welded steel legs turn this table into a true eye-catcher. The delicate waves along the faces of the drawers are reminiscent of lines in the sand left by the waves of the sea. These décors are made by skilled woodworkers and applied by hand to the fronts of the spacious drawers. The console table is available in white-washed oak, natural oiled oak and black-stained oak.